This year, there has been one colour that has completely stolen my heart and that’s lime. From lime yellow hues right through to lime greens, I am loving every single shade. 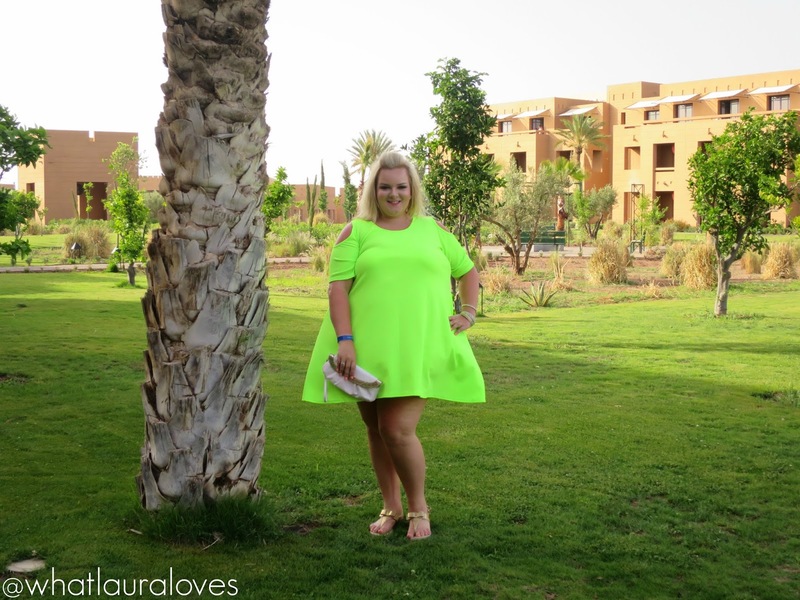 One of the first lime pieces that I bought was the Boohoo Plus Ruby Open Shoulder Swing Dress that I took away with me to Morocco. 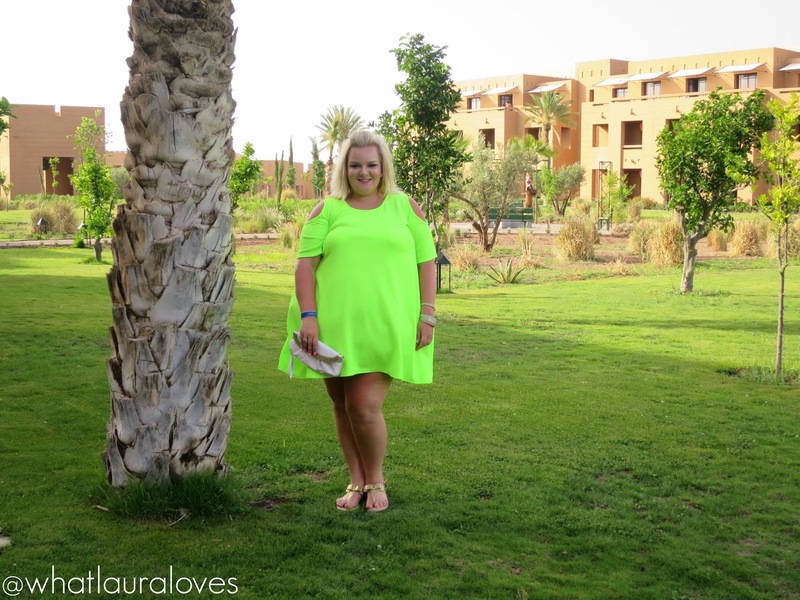 This piece was absolutely perfect for my holiday as the colour is so bright and vibrant, it looks fabulous with a tan. I love the cut out shoulder detail leading down to the sleeves and the relaxed swing shape of this generously sized dress. The material feels quite substantial, it isn’t flimsy at all and has a textured feel to it. While away, I paired it with my Michael Kors gold sandals, some gold bangles from Primark, a pair of gold heart stud earrings and a clutch that I got many, many years ago! It seems as though the high street are loving lime too as I’m seeing it everywhere in shops and online. I’m eagerly awaiting payday so that I can purchase some more lime pieces to wear before the end of the summer and on holiday in January. There are three pieces that I’ve currently got my eye on, starting with this gorgeous bra here. I have a black logo vest top that has a loose fit with long arm holes that shows my bra off at the sides when I wear it. I’m not usually a fan of showing my bra off under my arms but the arm holes seem to be relatively long and slim rather than wide so they aren’t too revealing. I think a little hint of lime would look lovely peeking through which is exactly what I have in mind for this bra. Plus, its a push up style which always gives me a great cleavage and looks great under vest tops. I was fantasy shopping on the Harvey Nichols website when I spotted this Moschino Lime Leather Cuff here and to be honest, its not THAT badly priced. I love the gold logo lettering that goes around it and the lime colour is just to die for. I would order it as soon as payday arrives but I do think that this is a piece that I would need to try on in store before ordering as it is only available in one size and I’d worry that, although its adjustable, it might not fit my wrist properly. I hate ordering things and getting all excited for them to arrive only to be let down if they don’t fit correctly! The third piece that I have been eyeing up are the lime toe post sandals here. I have a lime top that I wear with printed trousers quite often but I think it would be nice to add in a little extra bit of lime to the outfit and shoes are a great way to do this as they’ll be far enough away from the top that it doesn’t look like overkill. I do think that the lime on these shoes is toned down with the black detailing which makes them a great option if you’re wanting to venture into wearing a brighter colour but you don’t want to wear too much too soon. These sandals with an all black outfit would look amazing this summer. What lime pieces are you loving at the moment? Lovely dress, the color suits you well! This color brings me back to 7th grade when I had a huge obsession with lime. It's such a refreshing color.